An Shi Revolt (755) - Also called the An Lushan Rebellion because it was led by a general named An Lushan against the Tang Dynasty. As a general in the Tang army, he was in charge of protecting China's northern border. Having earned the trust of the emperor, he was given command of a substantial army, estimated to be about 164,000 at its height. But he had ambitions of his own, and plans of becoming emperor himself. The Tang loss at the Battle of Talas in 751 (see above) provided him with the opening he was looking for. The Tang expansion was halted at Talas, and for the first time the empire was considered vulnerable. 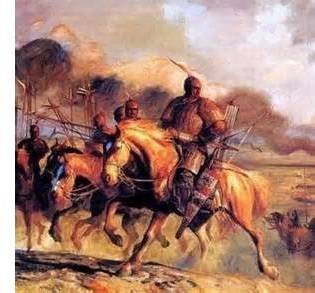 An Lushan launched his rebellion in 755. One of his first moves was to capture the ancient capital of Luoyang (the Tang capital was in Chang'an) and make it the capital of his newly established Yan Dynasty. While pretending to be loyal to the emperor, An Lushan had become so trusted that he was able to put the best troops in China under his command. And so, after taking Luoyang, he marched on the Tang capital of Chang'an and routed the army defending it. Emperor Xuanzong fled, along with his family and advisers. The defeat forced him to abdicate his throne in 756. It looked as though the rebellion was going to be successful and short. But, in early 757, An Lushan was assassinated by his own son. He had two; An Qingzong (the elder son), who had remained behind in Chang'an after its capture, and An Qingxu (the younger), who was traveling back to Luoyang with his father. An Qingzong was named An Lushan's heir, which didn't sit well with An Qingxu. On the return trip, An Qingxu struck down his father and may have had plans to kill his brother as well. Little did he know that An Qingzong had been captured by imperial forces in Chang'an and executed as a traitor to the Tang Dynasty. And so An Qingxu became the new emperor of the Yan. But not for long. Because An Lushan's childhood friend and top general, Shi Siming, killed An Qingxu in 759. Suddenly the rebellion, which had been going smoothly, was in disarray. The entire ruling family of the infant Yan Dynasty was now dead. So Shi Siming, who considered himself next in command, proclaimed himself emperor. The bad news for him is that he also had a son, Shi Chaoyi. He murdered his father in 761 and made himself emperor; the last of the short-lived Yan Dynasty. Because while all this drama was unfolding in Luoyang, the Tang Dynasty was regrouping. In 762, it marched an army on the Yan capital. The turmoil of the past few years had fractured the once mighty army that An Lushan created. Many of the soldiers who remained defected to the Tang fearing imminent defeat. And the Yan was finally defeated in the Winter of 762 when Luoyang fell. The rebellion was finally over after seven years. But it did not change the fact that the Tang Dynasty was still in decline. It would survive for another century and a half, but was only a shell of its former glory.